Law firms and attorneys need law firm SEO but many of them find themselves being taken advantage of by SEO agencies. They promise big results for little money but in reality they provide few results. The truth of the matter is high-quality SEO isn’t cheap nor is it realistic. Unless you’re paying about $1,000+ per month, you’re wasting your money. While this is an important point to understand, there are a few other things you must also understand. Instead, you must hire someone who can show you they’ve had real-world SEO success. They should be able to answer your questions and tell you how you’ll get organic traffic. Even better than telling you is being able to show you these things. You don’t want to spend money for Google Analytics that merely “look good.” This means that as a lawyer you must develop a basic understanding of charts and terms so you can communicate with the person you hire to manage your law firm SEO. Then you’ll need them to walk you through everything they’ve done for you over the month. This is something that should be done biweekly, then eventually it can move to monthly. Make sure you have good tracking in place (e.g. call tracking, goal tracking, event tracking, Google Analytics). 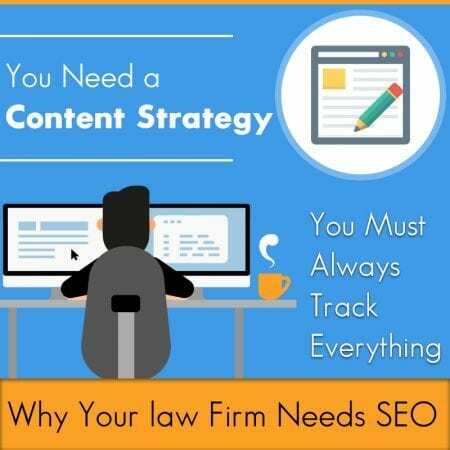 This is the only way you’ll know for sure that your law firm SEO is working. When you don’t create trackable goals, you won’t have the empirical evidence you need so you can make informed decisions so make sure you have all the proper tracking codes in place so you’ll know what pages are converting. You can then improve on the rest of your pages without simply guessing. You can’t expect to increase your traffic if you don’t have a content strategy. Law firm SEO isn’t magical and it won’t happen overnight. You’ll need a lot of hard work and content to increase your traffic, leads, and clients. Having a schedule is also important so you know what content you must write when. Having a partner who does your keyword research for you is helpful. One very important thing to always remember here is that unless the content is written by a lawyer, it shouldn’t give legal advice. This doesn’t mean you can’t create other types of high-quality, compelling content though. You must also have an aggressive link building strategy that’s updated to meet today’s standards. Essentially, this means you want to avoid directory links, forum commenting, and spammy tactics (e.g. PBNs – private blog networks). Transparency and quality over quantity are key here. It takes time to earn these links via strategies like conducting outreach and publishing link-worthy content. Clearly, you can see that all these law firm SEO strategies are going to require time and hard work that you probably don’t have. Fortunately, I SEO U has a proven track record demonstrated by their great portfolio and many highly satisfied clients. So, when you’re in need of law firm SEO make sure you remember their name so you can contact them right away. They look forward to adding you to their list of happy clients.